In an earlier article, we looked at how knowledge in the generic sense can be modelled as a triangle or pyramid, starting with data and information at the bottom, and then moving up to knowledge and wisdom. It’s a neat, systematic model that’s widely used within computer science and IT. The same model also provides a neat, systematic framework for choice of assessment methods. First, some scope and context: This article deals only with verbal and numeric assessment. Assessment of physical skills is a separate issue, which we’ll discuss in a later article. At the bottom of the pyramid we have data and information, where information is defined as structured data. An example is the information that the Battle of Edgehill took place in 1642. For assessment purposes, this level involves closed sets, where all the possible acceptable answers can be listed. This level lends itself well to classic tests, including most forms of multiple choice tests and computerised testing. Knowledge is defined here as information about information. Knowledge usually has a broader scope than information does, and is often imprecise by its very nature. An example is the knowledge that the Battle of Edgehill was inconclusive. For assessment purposes, this level involves semi-closed sets, where there is a core set of definitely acceptable answers, but where other acceptable answers are also possible. Because there can be correct answers that aren’t in the approved list, marking has to be performed by a human being, using their professional judgment; it can’t be handled properly by multiple choice tests or computerised assessment. Wisdom is defined here as knowledge about knowledge. An example is knowing that in most civil wars, the first battle is inconclusive. By its nature, wisdom usually involves synthesising a broad set of knowledge, much of which is incomplete, imperfect and debatable. For assessment purposes, this level involves open sets, where there is a potentially infinite number of answers that are arguably correct. The written thesis is a classic product of this level. The thesis contains an argument consisting of connected assertions and evidence. Usually a thesis is required to be an original piece of work, so its contents cannot be predicted in advance by the assessor. In extreme cases, a thesis might take a radically different approach from all previous work, focusing on a different set of causal factors and evidence, and might produce a compelling new explanation which becomes accepted as standard in the field. The end point of this analysis is much the same as current standard practice in educational assessment. However, what’s different is that the route to this end point is based on a systematic model, and a key point about this model is that it identifies clear limits to growth for computerised assessment. For higher levels of educational concepts – knowledge and wisdom – we are dealing with semi-closed and with open sets, which by their nature require assessment by a human being with professional knowledge and judgment. 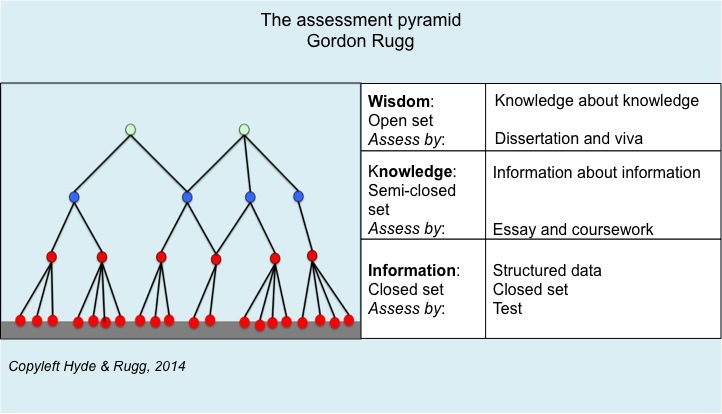 This entry was posted in education theory, visualisation and tagged assessment, knowledge pyramid, knowledge triangle, testing by hydeandrugg. Bookmark the permalink.